Note: Retailers & Distributors, you are welcome to use this description and artwork in your catalogs or product listing. Character-Driven Gaming - This is all up-close-n-personal, so you won't find large armies in this game. Specialties - Unique abilities eliminate "cookie-cutter" characters. Streamlined Combat Engine - Gameplay is fast and deadly! Initiative - Random actions impose a level of chaos, making this Western truly wild! Campaign System - Experience system allows characters to improve their abilities over time... if they live long enough. Online Support - Free downloads of all game aids, including Character Sheets, Horse Record Sheets, Vehicle Record Sheets, and free adventures. Quick-Start Guide - Experienced gamers can figure out most of the game basics by reading this one section of the book. 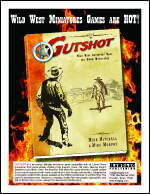 If you're already carrying Western miniatures, then Gutshot is a perfect addition to your catalogue. Our game is compatible with all 25mm-30mm figures, including those by Artizan, Foundry, Dixon, Old Glory, Monday Knight, Westwind, and others. In fact, the book is illustrated with photos of figures from most of these lines. Price - At only $24.95 for 178 pages, the book is a great bargain that prevents the “sticker shock” some gamers are experiencing with more-expensive products on the market. Appearance/Quality - The book itself is high-quality in appearance and printing quality. It is lavishly illustrated with photos, vintage and new artwork. It's a top-quality product that look great on your store shelves (and even better in your customer's hands). Discounts - We offer industry-standard discounts to both distributors and retailers. No Minimum Orders - If you just want to see one book before commiting to a larger order, that's fine with us! But... we will need to confirm that you're a bona fide retail outlet and not some flannel-mouthed tinhorn trying to scam a discounted book from us! In-Store Promotions - We have posters, flyers, and stock advertising to help you promote the game to your customers. Online Promotions - We advertise Gutshot on theminiaturespage.com and will be taking out other banner ads at key miniatures Websites to help spread the word about Gutshot, so you won't have to. Online Retailers List - Our Website has a list of all retailers who carry our game. We are very pro-active about getting our game onto your shelves. In-Store Demo Support - We offer prize support and incentives to stores/clubs that commit to run a five-game campaign. We believe that our campaign system is one of the strongest selling points and we're convinced that once people play in one, they'll be anxious to get Gutshot so they can run their own. If you're carrying our products, or considering carrying them, please contact us. We may be able to supply you with posters and other support materials. The Gutshot Core Rule Book has received lots of praise for its design and appearance. It is a quality book, lavishly illustrated, well written, and offers great shelf presence when sitting next to the other books in your store. But, see for yourself! This sample reprints the first 17 pages of the book, plus the first page from each section, the Table of Contents, Index and At a Glance pages. In other words, just enough to show you that you'll be investing in a solid, high-quality product. FLYER: Wild West Miniature Games are HOT! In other words, why your customers should get Gutshot! This is the flyer we created for the GAMA 2005 trade show, and it presents our game from the retailer's perspective. Note, most of the text above is pulled from this flyer, so it might seem familiar when you download it, but don't fret none. It's got some new stuff in there, too. Also, even though this is in color, it prints real purty in b&w, too. FLYER: Step into the boots of a Western Gunfighter! B&W flyer for you to advertise Gutshot in your shop or to your customers. On request, we can remove the price in the star and replace it with your store info. 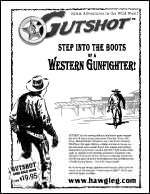 "Gutshot puts YOU in the boots of a Western Gunfighter!" Full-color poster to print out and put on your shop wall to advertise in-store games. Space is provided at the bottom for you to write in the time, date, and other info. Contact us and we'll be happy to customize it for you. Let Arizona, the lady gunslinger, entice the fanboys in your store! This full-color poster is available for you to print out and it's guaranteed to drive them whippersnapper's crazy! Note: This thing measures in at a whopping 23 x 35 inches, but it can be scaled down to other sizes. More posters, ads, and support material coming soon! Don't see what you need? Ask us and we'll try to create it for you! Our main goal is to get Gutshot onto the shelves of game stores. We think we've created a quality product that's a lot of fun to play, but it won't do us any good if no one ever sees it. That's why we will bust our butts to make sure that our main outlet will always be game distributors, Friendly Local Game Stores (FLGS), and comic book stores. To show our commitment, we promise not to undersell you on our Website: everything is sold at full retail price plus shipping. Additionally, although we cannot control what other people do, we will carefully reconsider doing business with anyone who buys our products and dumps them online with the intention of driving down the prices for everyone.